Home » Offbeat » Elenin, the latest doomsday bringer? Elenin, the latest doomsday bringer? 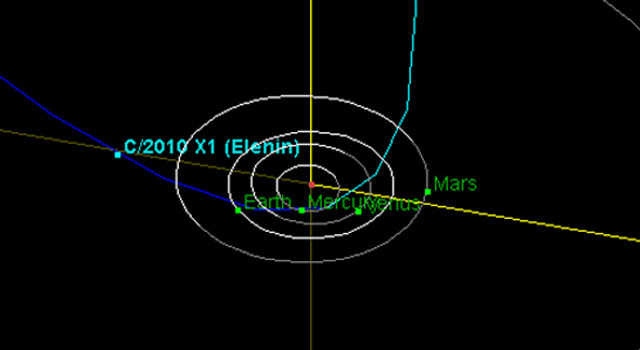 Elenin, the comet from the outer Oort cloud is the latest in the long list for doomsday bringer after Planet X, Nibiru, Global Warming, Pole Shift, Alien Invasion, etc. I am sure you readers have done your home work on this itsy bitsy Comet. Let us investigate more on this. Elenin is a comet like billion others from the Oort Cloud outside our beloved Solar System. It was named after an Russian astronomer Leonid Elenin who discovered the comet on December 10, 2010, remotely, using the International Scientific Optical Network’s robotic observatory near Mayhill, New Mexico, U.S.A. The comet is believed to be moving with a rate of 85,000 km /hr and is projected to pass millions of miles away from our Earth to the Sun and then take a curve back to return back towards the Earth with the distance of 35 million kilometers [about 22 million miles] between Earth and itself to disappear into the deep space. However, there have been a great deal of speculation among astronomers who are still finding it very hard to describe the exact size of the comet or its duration period. The Astronomers, are highly confident that Elenin will not impact or damage or cause threat to Earth in any way. What the Doomsday Knowers have to Say? In my view, our Planet will be the only one where every fool try to act God. One or the other comes out into the open with their own dates and claim that they knew what will cause the doomsday. When the God of Torah, Bible and Quran, repeatedly told his Prophets, Only I knew the Hour and no man knew not. Yet, people try to play with God. Extinction Level Event is the name given to Elenin by the cash making Doomsday knowers. When no such thing happened, they relate it to Elenin comet with an ideal excuse terming Elenin to be Nibiru. I say, some law has to be formed to stopped such people. 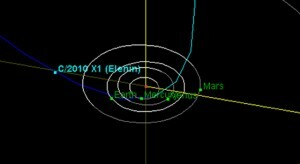 The readers should note that, Elenin is a mere comet with millions of miles away from our Earth. It does not poke any risk to life on Earth. Previous: How U.S Wasted $34 billion in Afgan and Iraq ?